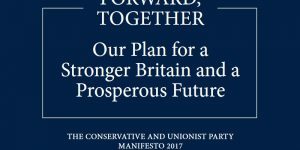 A Strong Economy That Works For Everyone is part of the Conservative Parties 2017 General Election Manifesto. A strong economy built on sound public finances, low taxes, better regulation and free trade deals with markets around the world. A new deal for ordinary, working people giving them a decent living wage and new rights and protections in the workplace. Fairer corporate governance, built on new rules for takeovers, executive pay and worker representation on company boards. Growth across the country through our modern industrial strategy and major investment in infrastructure, skills and research and development. Competitive and affordable energy costs following a new independent review into the cost of energy. Prosperous towns and cities, underpinned by strong local institutions, the relocation of government functions, and shared cultural assets across the country. A strong economy is the basis for everything we want to achieve as a nation. If we are to have the prosperity, security and quality of life that Britain desires, we need to have an economy that is vibrant and robust. But our economy also needs to be equitable. For in Britain today, there is a division between those people and places that have benefited from a changed global market, where opportunity is displayed in affluence and a good quality of life; and those people and places that have experienced a struggling economy, where opportunity has receded and people worry about their children’s futures. This is not right. So we will forge an economy that works for everyone in every part of this country. We will found our plans on the principles of sound public finances, low taxes, free trade and effective regulation. We will set rules for businesses that inspire the confidence of workers and investors alike. That is only the foundation, however. With our modern industrial strategy, we will build an economy that invests for the long term and supports growth across the whole country – not just in those places that have done well in the past few decades but also where prosperity has waned. Governments cannot use public money to prop up failing businesses, but they also cannot allow people and their communities to be cast aside. It is our duty to bring opportunity to every part of our nation and to ensure that we all prosper together. Sound money and responsible public finances are the essential foundations of national economic success. A government that cannot manage its money properly cannot command confidence at home or with international investors. Firms and households cannot plan ahead if the government’s thirst for their cash threatens higher taxes and cuts to vital services and investment; and when things spiral out of control, it is ordinary, working people who are hit hardest. The Conservatives have laid these essential foundations. Ten years after the banking crisis, the deficit is back to where it was. The independent Office for Budget Responsibility forecasts that the national debt is finally about to start falling. There is still work to do on deficit reduction, so we will continue to restore the public finances over the course of the next parliament. We will continue with the fiscal rules announced by the chancellor in the autumn statement last year, which will guide us to a balanced budget by the middle of the next decade. This is our foundation. The time has now come to focus on Britain’s next big economic challenge: to foster growth that works for everyone, right across our country. Paying your fair share of tax is the price of living in a civilised democracy but politicians should never forget that taxes are levied on businesses that employ people, and individuals who work hard and face tough decisions about how they spend their money. The Conservatives will always be the party that keeps tax as low as possible and spends the proceeds responsibly. It is our firm intention to reduce taxes on Britain’s businesses and working families. By 2020, we will, as promised, increase the personal allowance to £12,500 and the higher rate to £50,000. We will continue to ensure that local residents can veto high increases in Council Tax via a referendum. And we will not increase the level of Value Added Tax. Corporation Tax is due to fall to seventeen per cent by 2020 – the lowest rate of any developed economy – and we will stick to that plan, because it will help to bring huge investment and many thousands of jobs to the UK. We know that the business rates system presents considerable challenges to some smaller companies. That is why we have supported those businesses most affected by the recent revaluation of business rates. That is not all we will do. We will make longer-term reforms to the system to address concerns about the way it currently works. We will make sure that revaluations are conducted more frequently to avoid large changes to the bills that businesses face, and explore the introduction of self-assessments in the valuation process. To ensure the system is sustainable for the future we will also conduct a full review of the business rates system to make sure it is up to date for a world in which people increasingly shop online. A good tax system is not just about the headline rates of tax, however, but about its simplicity. Our system remains too complicated, making it hard for people – especially self-employed people and small businesses – to assess their taxes. We will therefore simplify the tax system. Britain has always been a great trading nation. Trade will continue to be crucial to our future growth and prosperity. As we leave the European Union, we want to negotiate a new deep and special partnership with the EU, which will allow free trade between the UK and the EU’s member states. As part of the agreement we strike, we want to make sure that there are as few barriers to trade and investment as possible. Leaving the European Union also means we will be free to strike our own trade agreements with countries outside the EU. We will ensure immediate stability by lodging new UK schedules with the World Trade Organization, in alignment with EU schedules to which we are bound whilst still a member of the European Union. We will seek to replicate all existing EU free trade agreements and support the ratification of trade agreements entered into during our EU membership. We will continue to support the global multilateral rules-based trade system. We will introduce a Trade Bill in the next parliament. We will create a network of Her Majesty’s Trade Commissioners to head nine new regional overseas posts. These commissioners will lead export promotion, investment and trade policy overseas. We will reconvene the Board of Trade with a membership specifically charged with ensuring that we increase exports from Scotland, Wales and Northern Ireland as well as England, and that trade policy is directly influenced by every part of our United Kingdom. We will work to forge a new culture of exporting among UK businesses, equipping them with the tools and opportunities they need to succeed in the global marketplace, and take advantage of new high-growth markets around the world. We will take a more active role in supporting British consortia to win the largest and most innovative contracts around the world. We will ensure that small and medium-sized businesses are able to identify the right markets and sectors to win vital contracts abroad. We will put UK Export Finance, which ensures that no viable UK export fails for lack of finance or insurance, at the heart of the UK’s trade promotion proposition. And we will encourage the world to visit, study and do business in the UK through the GREAT Britain campaign and Visit Britain. Regulation is necessary for the proper ordering of any economy and to ensure that people – and their investments – are protected. However, poor and excessive government regulation limits growth for no good reason. So we will continue to regulate more efficiently, saving £9 billion through the Red Tape Challenge and the One-In-Two-Out Rule. Reducing the cost of regulation is not just about reducing its volume. The wrong regulatory frameworks can over-reward investors for the risk they are taking in backing a particular project, meaning households and businesses can become systematically overcharged. We will therefore examine ways in which the regulation of utilities and transport infrastructure can be improved to deliver a better deal for customers and sharper incentives for investment efficiency. Conservatives believe that if you value something, you must be prepared to reform it in order to conserve it. So it is today with our economy. Capitalism and free markets remain the best way to deliver prosperity and economic security, lifting millions of people out of poverty around the world. Markets need rules and these rules need to be updated to reflect our changing economy. We must first ensure that everyone is paid fairly for their work. It was a Conservative government that introduced the National Living Wage and as a result, people across the United Kingdom now receive a minimum of £7.50 an hour. 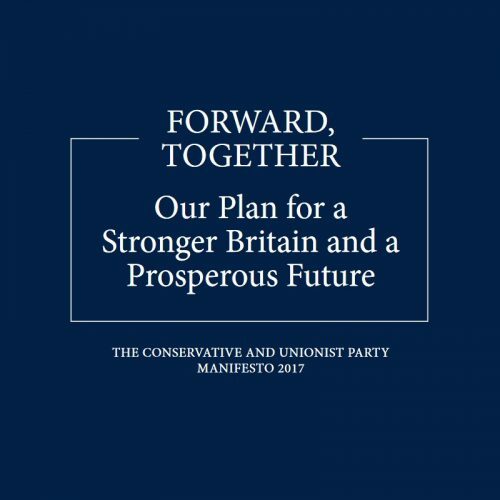 A new Conservative government will continue to increase the National Living Wage to 60 per cent of median earnings by 2020 and then by the rate of median earnings, so that people who are on the lowest pay benefit from the same improvements in earnings as higher paid workers. In the modern economy many people choose jobs like driving, delivering and coding, that are highly flexible and can be mixed with other employment. This brings considerable advantages to millions of people but we should not ignore the challenges this kind of employment creates. These workers are officially classed as self-employed and therefore have fewer pension entitlements, reduced access to benefits, and no qualification for sick pay and holiday pay. Yet the nature of their work is different from the traditional self-employed worker who might be a sole trader, a freelancer or running their own business. We will make sure that people working in the ‘gig’ economy are properly protected. Last October, the government commissioned Matthew Taylor, the chief executive of the Royal Society of Arts, to review the changing labour market. We await his final report but a new Conservative government will act to ensure that the interests of employees on traditional contracts, the self-employed and those people working in the ‘gig’ economy are all properly protected. We have taken vigorous action against tax avoidance and evasion, closing the tax gap – the difference between the amount of tax due and the amount collected – to one of the lowest in the world. We will now go further. We will legislate for tougher regulation of tax advisory firms. We will take a more proactive approach to transparency and misuse of trusts. We will improve HMRC’s capabilities to stamp down on smuggling, including by improving our policing of the border as we leave the European Union. We will also take further measures to reduce online fraud in Value Added Tax. Millions of people in this country look forward to a more secure retirement because of their private pension. These pensions exist because employees have saved diligently through their life, often foregoing luxuries and holidays abroad. Those people did the right thing. Business owners who abuse pension funds and put them at risk, sometimes for their own lavish enrichment, are entirely in the wrong. The current powers of regulators and the Pension Protection Fund are insufficient to ensure that pension savers, pensioners and prudent company directors are protected from unscrupulous business owners. A Conservative government will act to tighten the rules against such abuse, and increase the punishment for those caught mismanaging pension schemes. We will build on existing powers to give pension schemes and the Pensions Regulator the right to scrutinise, clear with conditions or in extreme cases stop mergers, takeovers or large financial commitments that threaten the solvency of the scheme. We will also give the Pensions Regulator new powers to issue punitive fines for those found to have wilfully left a pension scheme under-resourced and, if necessary, powers similar to those already held by the Insolvency Service to disqualify the company directors in question. We will consider introducing a new criminal offence for company directors who deliberately or recklessly put at risk the ability of a pension scheme to meet its obligations. Conservatives believe in the rights of business owners. We want to be a global nation that is competitive, outward-looking and open for business – the best country in Europe for doing business. We welcome overseas investment and want investors to succeed here but not when success is driven by aggressive asset-stripping or tax avoidance. We will update the rules that govern mergers and takeovers. This will require careful deliberation but we can state now that we will require bidders to be clear about their intentions from the outset of the bid process; that all promises and undertakings made in the course of takeover bids can be legally enforced afterwards; and that the government can require a bid to be paused to allow greater scrutiny. We believe people should be rewarded for their talents and efforts but the public is rightly affronted by the remuneration of some corporate leaders. Senior corporate pay has risen far faster than corporate performance, and the gap between those paid most and those paid least has grown from 47:1 in 1998 to 128:1 in 2015. The next Conservative government will legislate to make executive pay packages subject to strict annual votes by shareholders and listed companies will have to publish the ratio of executive pay to broader UK workforce pay. Companies will have to explain their pay policies, particularly complex incentive schemes, better. We will commission an examination of the use of share buybacks, with a view to ensuring these cannot be used artificially to hit performance targets and inflate executive pay. The modern joint stock company is a British invention. It works because it is rules-based, but the rules need to change as the world changes. Boards should take account of the interests not just of shareholders but employees, suppliers and the wider community. To ensure employees’ interests are represented at board level, we will change the law to ensure that listed companies will be required either to nominate a director from the workforce, create a formal employee advisory council or assign specific responsibility for employee representation to a designated non-executive director. Subject to sensible safeguards, we will introduce, for employees, a right to request information relating to the future direction of the company. These strengthened arrangements will apply to publicly-listed companies. We will consult on how we might strengthen the corporate governance of privately-owned businesses. Our modern industrial strategy is designed to deliver a stronger economy that works for everyone – where wealth and opportunity are spread across every community in the United Kingdom, not just the most prosperous places in London and the south east. It will help young people to develop the skills they need to do the high-paid, high-skilled jobs of the future. And it will back Britain for the long term: creating the conditions where successful businesses can emerge and grow, and helping them to invest in the future of our nation. The strategy is not about picking winners, propping up failing industries, or bringing back old companies from the dead. It is about identifying the industries that are of strategic value to our economy and supporting and promoting them through policies on trade, tax, infrastructure, skills, training, and research and development – just the same as in every other major and growing economy in the world. It is about identifying the places that have the potential to contribute towards economic growth and become homes to millions of new jobs. And, because this is about meeting our economy’s long term challenges, the industrial strategy will focus on creating the right institutional framework to make the strategy last for decades to come. We will spend more on research and development, to turn brilliant discoveries into practical products and transform the world’s industries – such as the batteries that will power a new generation of clean, efficient, electric vehicles. We will establish funding streams to ensure investment for the long term, and make a modern technical education available to everyone, throughout their lives, to provide the skills they need. We will remove the barriers that hold back small firms with big potential – and let them compete when government itself is the buyer. We will build on the success of world-beating sectors such as car and aero manufacturing, financial services, life sciences, digital technology and our creative industries, and help other sectors develop the conditions which they need to thrive. We will ensure industry and businesses have access to reliable, cheap and clean power. We will deliver the infrastructure – the road, rail, airports and broadband – that businesses need. Our long-term prosperity depends upon science, technology and innovation. The UK has an outstanding science base and many world-leading tech companies. We now need to go further. Our ambition is that the UK should be the most innovative country in the world. – that is, 2.4 per cent of GDP – within ten years, with a longer-term goal of three per cent. We will increase the number of scientists working in the UK and enable leading scientists from around the world to work here. We will work hard to ensure we have a regulatory environment that encourages innovation. Our world-beating universities will lead the expansion of our R&D capacity. We must help them make a success of their discoveries – while they have a number of growing investment funds specialising in spin-outs, we have more to do to replicate the success of similar university funds in the United States. To fix that, we will work to build up the investment funds of our universities across the UK. We want larger, aggregated funds to increase significantly the amounts invested in and by universities. We want universities to enjoy the commercial fruits of their research, through funds that are large enough to list, thereby giving British investors a chance to share in their success. If our modern industrial strategy is to succeed, it must address the UK’s slow productivity growth and it must be funded properly from the start. So we have launched a new £23 billion National Productivity Investment Fund. The government will target this spending at areas that are critical for productivity: housing, research and development, economic infrastructure and skills. This will include £740 million of digital infrastructure investment, the largest investment in railways since Victorian times, £1.1 billion to improve local transport and £250 million in skills by the end of 2020. The National Productivity Investment Fund will take total spending on housing, economic infrastructure and R&D to £170 billion during the next parliament. People have long talked about the need to create UK sovereign wealth funds. We will now make this a central part of our long-term plan for Britain. We will create a number of such funds, known as Future Britain funds, which will hold in trust the investments of the British people, backing British infrastructure and the British economy. We anticipate early funds being created out of revenues from shale gas extraction, dormant assets, and the receipts of sale of some public assets. We will encourage pension funds with an interest in joining Future Britain funds to do so. As we set out in chapter three, the next Conservative government will give Britain the technical education it has lacked for decades. This will take time but we must also address the immediate needs of those sectors of the economy suffering shortages in skills. We will make the immigration system work for these sectors, whilst ensuring that we develop the skills we need for the future. We will therefore ask the independent Migration Advisory Committee to make recommendations to the government about how the visa system can become better aligned with our modern industrial strategy. We envisage that the committee’s advice will allow us to set aside significant numbers of visas for workers in strategically-important sectors, such as digital technology, without adding to net migration as a whole. However, skilled immigration should not be a way for government or business to avoid their obligations to improve the skills of the British workforce. So we will double the Immigration Skills Charge levied on companies employing migrant workers, to £2,000 a year by the end of the parliament, using the revenue generated to invest in higher level skills training for workers in the UK. The Conservative Party is the party of enterprise and of the entrepreneur. We understand that small businesses are the wellspring of growth. They form a key part of British life, valued for their contribution to every community across the country. We will continue to support small businesses through business rate relief and low taxation, and by reducing the bureaucracy and regulation that prevents small businesses from flourishing. As part of broader reforms to the business energy market, we will consult on how to extend our safeguard tariff cap to micro-businesses. Central government must play a role in supporting SMEs: across all government departments, we will ensure that 33 per cent of central government purchasing will come from SMEs by the end of the parliament. As part of our modern industrial strategy, we will explore how government can do even more to support innovation by small and start-up firms. We also recognise that government can improve the general business environment for SMEs, so we will use our buying power to ensure that big contractors comply with the Prompt Payment Code both on government contracts and in their work with others. If they do not do so, they will lose the right to bid for government contracts. Our modern industrial strategy is not about ‘planning’ the economy. It is about helping old industries find prosperous new life and unlock future opportunities, and new industries to grow. Some industries have a great history. We believe they can have a great future too. We have already demonstrated that in advanced manufacturing, such as aero and automotive engineering, we can lead the world. We will continue to support these key industries so that they can grow further. We want to replicate that success in other sectors – like shipbuilding where, for the first time in decades, there is the prospect of a renaissance. We will take forward Sir John Parker’s review of shipbuilding, helping our shipyards modernise and collaborate. We want to see shipbuilding growing on the Clyde and on the Forth, in Belfast and in Barrow, and in the north-east and south of England. Other industries, like the oil and gas sector, are transforming. The North Sea has provided more than £300 billion in tax revenue to the UK economy and supports thousands of highly-skilled jobs across Britain. We will ensure that the sector continues to play a critical role in our economy and domestic energy supply, supporting further investment in the UK’s natural resources. We will continue to support the industry and build on the unprecedented support already provided to the oil and gas sector. While there are very significant reserves still in the North Sea, it is expected to be the first major oil and gas basin in the world to decommission fully, and we will take advantage of that to support the development of a world-leading decommissioning industry. We will work with the industry to create a multi-use yard and the UK’s first ultra-deep water port to support this industry. Other industries are already highly successful. Life sciences, for example, employs 175,000 people and many of the world’s top medicines have been developed in the UK. We will continue to support research into the diagnosis and treatment of rare cancers and other diseases, including Genomics England’s work in decoding 100,000 genomes. This, together with the development of stronger research links with the NHS, can help scientists and doctors design more effective and personalised treatments, and help maintain our position as the European hub for life sciences. A successful industrial strategy requires competitive and affordable energy costs. We want to make sure that the cost of energy in Britain is internationally competitive, both for businesses and households. We will therefore commission an independent review into the Cost of Energy, which will be asked to make recommendations as to how we can ensure UK energy costs are as low as possible, while ensuring a reliable supply and allowing us to meet our 2050 carbon reduction objective. Our ambition is that the UK should have the lowest energy costs in Europe, both for households and businesses. So as we upgrade our energy infrastructure, we will do it in an affordable way, consistent with that ambition. And because for British companies, an energy-efficient business is a more competitive business, we will establish an industrial energy efficiency scheme to help large companies install measures to cut their energy use and their bills. We want to see a diverse range of sources for Britain’s energy production, because a diverse energy economy is the best way to stimulate innovation, and also to ensure that we are getting the right generation in the right place. For instance, while we do not believe that more large-scale onshore wind power is right for England, we will maintain our position as a global leader in offshore wind and support the development of wind projects in the remote islands of Scotland, where they will directly benefit local communities. Above all, we believe that energy policy should be focused on outcomes rather than the means by which we reach our objectives. So, after we have left the European Union, we will form our energy policy based not on the way energy is generated but on the ends we desire – reliable and affordable energy, seizing the industrial opportunity that new technology presents and meeting our global commitments on climate change. The discovery and extraction of shale gas in the United States has been a revolution. Gas prices have fallen, driving growth in the American economy and pushing down prices for consumers. The US has become less reliant on imported foreign energy and is more secure as a result. And because shale is cleaner than coal, it can also help reduce carbon emissions. We believe that shale energy has the potential to do the same thing in Britain, and could play a crucial role in rebalancing our economy. We will therefore develop the shale industry in Britain. We will only be able to do so if we maintain public confidence in the process, if we uphold our rigorous environmental protections, and if we ensure the proceeds of the wealth generated by shale energy are shared with the communities affected. We will legislate to change planning law for shale applications. Non-fracking drilling will be treated as permitted development, expert planning functions will be established to support local councils, and, when necessary, major shale planning decisions will be made the responsibility of the National Planning Regime. We will set up a new Shale Environmental Regulator, which will assume the relevant functions of the Health and Safety Executive, the Environment Agency and the Department for Business, Energy and Industrial Strategy. This will provide clear governance and accountability, become a source of expertise, and allow decisions to be made fairly but swiftly. Finally, we will change the proposed Shale Wealth Fund so a greater percentage of the tax revenues from shale gas directly benefit the communities that host the extraction sites. Where communities decide that it is right for them, we will allow payments to be made directly to local people themselves. A significant share of the remaining tax revenues will be invested for the benefit of the country at large. We are working through one of the largest-ever investment programmes in our roads and railways, putting some £40 billion into transport improvements across the United Kingdom over the rest of this decade. We are investing to reduce travel time and cost, increase capacity and attract investment here in the UK. We will continue our programme of strategic national investments, including High Speed 2, Northern Powerhouse Rail and the expansion of Heathrow Airport – and we will ensure that these great projects do as much as possible to develop the skills and careers of British workers. We will continue to develop the strategic road network, providing extra lanes on our motorways and improving key routes whilst also paying attention to parts of the country left behind because of poor transport connections. We will continue to invest in roads to fix pinch points and open up opportunities for new housing and local growth. Our ambition is for Britain to lead the world in electric vehicle technology and use. We want almost every car and van to be zero-emission by 2050 – and will invest £600 million by 2020 to help achieve it. We will invest in more low-emission buses, as well as supporting audio-visual displays for bus passengers and community minibuses for rural areas poorly served by public transport. We will focus on creating extra capacity on the railways, which will ease overcrowding, bring new lines and stations, and improve existing routes – including for freight. We will increase services on our main lines and commuter routes, and launch new services to places which are poorly served or host major new housing projects. We will continue to support local authorities to expand cycle networks and upgrade facilities for cyclists at railway stations. We have seen welcome growth and civic renewal in some major cities. There remains, however, a far greater gap between the capital and other cities in the UK than in any other major developed country. We see the opportunity to close this gap as the biggest prize in Britain today. It will be a great endeavour by government, business and civic society over many years. We are determined to lead the way in the next parliament. First, we recognise the value of institutions to the vitality of towns and cities. As we explain in chapter two, it is why we are determined to move many of the functions of central government out to cities around Britain where possible and to see our vast cultural assets reach people around our country too. It is also why we will support local growth through combined authorities, mayoralties and local enterprise partnerships. We will make each partnership and combined authority responsible for co-ordinating their own local industrial strategy in alignment with our national industrial strategy, bringing together local businesses, political and public sector leaders to drive growth and economic regeneration. We will wherever possible deliver growth funding through these organisations. We will give local enterprise partnerships greater weight by backing them in law. Our institutions of education, old and new, will be critical to spreading success. It is why we will back new scientific and technical institutions. It is why we want to see universities make their full contribution to their local community and economy, sponsoring local schools and being creative about how they can open up opportunities for local people, especially those from ordinary working backgrounds. Our towns and cities excel when they have vibrant cultural life. Britain’s arts and culture are world-beating and are at the heart of the regeneration of much of modern Britain. We will continue our strong support for the arts, and ensure more of that support is based outside London. We will maintain free entry to the permanent collections of our major national museums and galleries. We will introduce a new cultural development fund to use cultural investment to turn around communities. We will hold a Great Exhibition of the North in 2018, to celebrate amazing achievements in innovation, the arts and engineering. We will support a UK city in making a bid to host the 2022 Commonwealth Games. And in this 70th Anniversary Year of the Edinburgh Festival we will support the development of the new Edinburgh Concert Hall, reaffirming Edinburgh as the UK’s leading festival city and a cultural beacon around the globe. Our towns and cities should be healthy, well-designed and well-tended places. We will take action against poor air quality in urban areas. In addition to the 11 million trees we are planting across our nation, we will ensure that 1 million more are planted in our towns and cities, and place new duties on councils to consult when they wish to cut down street trees. We will encourage the very best practice in the design of buildings and public spaces, including a review of the design of government buildings, to ensure that when the state builds, it makes a positive contribution to a local area. We will do more to reduce litter, including by supporting comprehensive rubbish collection and recycling, supporting better packaging, taking new powers to force councils to remove roadside litter and prosecuting offenders. We will do more to improve the quality of road surfaces, filling potholes – especially in residential areas – and reducing road noise. We will bring sustainable growth to the rural economy and boost our rural areas, so that people who live in the countryside have the same opportunities as those who live in our towns and cities. We have huge ambitions for our farming industry: we are determined to grow more, sell more and export more great British food. We want to provide stability to farmers as we leave the EU and set up new frameworks for supporting food production and stewardship of the countryside. So we will continue to commit the same cash total in funds for farm support until the end of the parliament. We will work with farmers, food producers and environmental experts across Britain and with the devolved administrations to devise a new agri-environment system, to be introduced in the following parliament. Our countryside and rural communities have been moulded by generations of farmers. We will help Natural England to expand their provision of technical expertise to farmers to deliver environmental improvements on a landscape scale, from enriching soil fertility to planting hedgerows and building dry stone walls. We will deliver on our commitment to improve natural flood management, such as improving the quality of water courses to protect against soil erosion and damage to vulnerable habitats and communities. We will continue to ensure that public forests and woodland are kept in trust for the nation, and provide stronger protections for our ancient woodland. We will continue to take action to improve animal welfare. We will implement our proposed reforms on pet sales and licensing and will make CCTV recording in slaughterhouses mandatory. As we leave the European Union, we can take early steps to control the export of live farm animals for slaughter. We will also take steps to enhance the provision of public services in rural areas. We will safeguard the post office network, to protect existing rural services and work with the Post Office to extend the availability of business and banking services to families and small businesses in rural areas. A third of all SMEs in rural areas use their post office weekly and our ambition is that all routine small business and consumer banking services should be available in rural post offices. We will support pharmacies and village schools in rural areas. We will grant a free vote, on a government bill in government time, to give parliament the opportunity to decide the future of the Hunting Act. Finally, we pledge to be the first generation to leave the environment in a better state than we inherited it. That is why we shall produce a comprehensive 25 Year Environment Plan that will chart how we will improve our environment as we leave the European Union and take control of our environmental legislation again. Decades of profound economic change have left their mark on coastal communities around Britain. We will continue to work to ensure these communities enjoy the vitality and opportunity they deserve. In England, we will extend our successful Coastal Communities Fund to 2022, helping our seaside towns thrive. When we leave the European Union and its Common Fisheries Policy, we will be fully responsible for the access and management of the waters where we have historically exercised sovereign control. A new Conservative government will work with the fishing industry and with our world-class marine scientists, as well as the devolved administrations, to introduce a new regime for commercial fishing that will preserve and increase fish stocks and help to ensure prosperity for a new generation of fishermen. To provide complete legal certainty to our neighbours and clarity during our negotiations with the European Union, we will withdraw from the London Fisheries Convention. We will continue our work to conserve the marine environment off the coast of the United Kingdom.